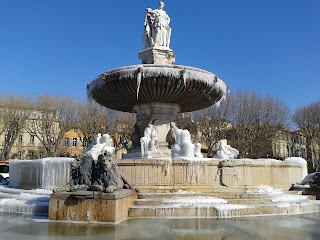 We continue to freeze here in the South of France, we were up to -9 degrees C this morning in Aix(! ), with orange weather alerts around France from Météo France (the French national weather service), and yesterday, l'alerte rouge EcoWatt (red alert) from Réseau de transport d'électricité (RTE, the network that tracks the transmission of electricity), due to record-breaking electrical power usage nation-wide. People are staying in, sports teams are cancelling trainings, and even the professional football matches this weekend are all being moved up to earlier daylight hours when the temperatures might rise out of the negative degrees. In some areas, school buses are still not running (although the schools seem to be open to receive any students who do make it in), citizens are being asked to turn off all standby electronic devices, and the Nice airport reportedly took itself off the power grid yesterday and ran on generators in order to ensure enough power to the Cote d'Azur! (See The Connexion for this and other weather-related stories, http://www.connexionfrance.com/Weather-Meteo-France-school-buses-freezing-power-13436-view-article.html). It's COLD! Here's the beautifully ice-encrusted Rotonde fountain in the center of Aix. I was one of many amateur photographers out yesterday snapping photos. Despite the freezing temperatures, Aix has actually been a hopping place, primarily because we are nearing the end of les soldes (the four-week sale season). 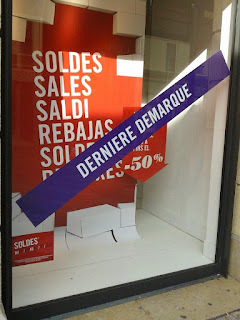 I'd wondered about after-holiday sales in a post back in January, and several French friends made sure I knew about the annual sales starting on a set date in early January and lasting five weeks, until mid February. This is one of two national sales seasons, allowed by the state, in which retailers are allowed to sell their goods, get this, at a loss(!). Retailers can run promotions at other times, but may not sell items below cost at those times. Each week during the sale in Aix, new signs have appeared in shop windows, revealing a new demarque (price reduction). If you could brave the cold and stand the lines, there were deals to be had, for sure, especially by the dernière demarque (the final mark-down). The state-regulated retail sale season and the national alerts related to le grand froid (the big cold spell) have really gotten me thinking about the relationship between l'état (the state) and its people. France is one of the most centralized societies in Europe, and the government is much more present in the daily lives of its residents. While I wondered why my kids were left out in the cold at school on that first snowy day last week (see my previous post), since that day, it's clear that the national weather and power alerts are being taken seriously, almost as directives from the state, especially in regards to children and to health (my boys' rugby and soccer tournaments and trainings have been canceled several times already due to the extreme cold, and not just due to the field conditions). And while I don't know any French retailers, I find it interesting how normal it seems to everyone, to have twice-annual sales. In contrast, in the free market U.S., no retailers would ever accept such conditions about when one could clear out merchandise at bargain basement prices, and consumers certainly expect sales year round. And while there is a U.S. national weather service and no single power supplier, the weight of the weather service announcements are diluted by the many private weather forecasters and news station reports, so there is no one organization whose alerts are the end-all, be-all ones. (In the U.S. we do have that funny U.S. Emergency Broadcast System now apparently replaced by the Emergency Alert System, that makes its monthly beeping tests on the radio and some t.v. stations, but I cannot ever remember being alerted by it for real. Maybe a presidential directive would carry some weight, but in general the U.S. president does not make pronouncements for activities at the local level.) This means that weather-related decisions are made by governors, individual organizations, and private companies, based on a variety of sources. Think of the U.S. public school districts which are soundly criticized at every turn, whether they take the advice of the weather services or television stations or not, while private sports organizations rarely cancel due to economic obligations, and may do so only when lives are actually at stake, such as in the case of imminent lightning storms or tornadoes.